De facto partner visa applications. Easy? We at Down Under Visa manage a lot of Australian partner visa applications. Most of them are for couples who are married or will marry, but many are for de facto couples. Yes, it’s possible to apply for a partner visa based on a genuine and established de facto relationship. And why do people apply as de facto couples? Mostly because one or both of them are still married. Annulments take a long time in the Philippines to organize, and some couples prefer to avoid this if they can. Hard to blame them, really. Can you apply for a partner visa as a de facto couple if one or both of you are still married legally to someone else? Yes, as long as the new relationship is genuine and exclusive. In other words if one of you is still physically/emotionally/romantically involved with the legal spouse, then no you can’t. But if that relationship is over bar the paperwork, then yes you can. It happens all the time. Is it easy to apply as a de facto couple? It’s easier if the relationship is genuine. If it’s not, then it’s hard. Why? Because they don’t like people playing the system. If they let someone in on a permanent visa (or on a temporary visa that leads to a permanent visa), then they want to see that the application is genuine. That’s fair enough. But no, it’s never actually easy. There’s a lot of work involved. What they want to avoid is those who think this is an easy option, and that they can avoid the commitment of a marriage to get a quick visa based on a relationship they can easily walk away from later. Picture a student visa holder sharing a house with a flatmate or two. Student visa is running out. What the heck! Get a flatmate to pretend they’re a de facto couple. Both have the same address, right? Wrong! There’s a big difference between sharing an address, or even sharing a bed, and living in a genuine de facto relationship. 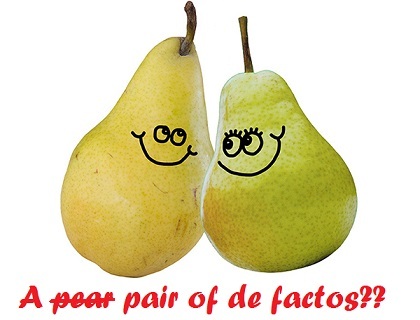 De facto does not mean “friends with benefits”. It means “in fact, in reality, in actual existence”. Basically, you are a married couple without the piece of paper. All other aspects of commitment to each other and leading a shared-life, they should be there. And of course they will scrutinize the evidence provided to see that this relationship exists. Do they have the right to do this (ie. scrutinize your evidence and make a decision)? Yes, they do. They have the legal right, and they have the legal obligation. Do you have the right to be believed? No, not at all. So never assume that your relationship is obvious, and “Surely they can see that?” Famous last words! Is a de facto partner visa application something you should organize yourselves? You’re perfectly entitled to organize any visa application for yourselves that you like. But from our experience as Registered Migration Agents who specialize in partner visa applications from the Philippines to Australia, I hope that you think this one through carefully. Partner visa applications are challenging enough. Add the need to prove that a de facto relationship exists onto that, and you have a tough job ahead of you. If they are not absolutely convinced, then they will refuse the application. Get some professional help! Divorce in Australia – Is this an option? Aussie-friendly places in the Philippines? I would imagine we could, Victor. Please complete the visa assessment form on the website, and I’ll get back to you with some details. Hello there, i’m a filipina but worked here in Singapore. I just wanna ask if its possible to process a de facto visa while a tourist visa? or is it possible to process a de facto visa in the Philippines while am here in Singapore working? Thank you. It would be best if you could complete our online assessment form, and I can get back to you about your case, Maria. Thanks. I am currently in a 3 yr relationship but my partner is still legally married. We are not living together as we are in Dubai and we wanted to migrate to Australia for our future. Annulment in the Philippines will take a lot of time and money. We would like to apply for student visa with him as my de facto. Anyone knows a similar case like us? We don’t get involved with student visas, sorry. But I will tell you that you need to convince them absolutely that your intention is NOT to “migrate to Australia for your future”. You need to convince them that you are going to Australia because you have a genuine intent to study, and it doesn’t sound like that is the case.